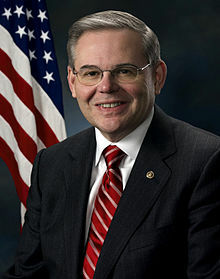 Federal prosecutors are fighting back against claims by Sen. Robert Menendez that the allegations against him are based on lies by the FBI and misconduct by the government. The Wall Street Journal reports that the New Jersey Democrat is accusing prosecutors of relying on misstatements by girlfriends, lawmakers and members of the Obama administration. Prosecutors fired back in a pair of federal court filings in New Jersey. Menendez, 61, has denied charges that he accepted nearly $1 million in gifts and campaign contributions from a Florida eye doctor. He has pleaded not guilty. Posted: 8/25/15 at 8:31 AM under News Story.